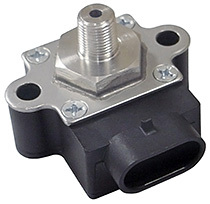 AMETEK’s Model SPT pressure transducer is general purpose pressure sensor, used in a variety of industries and applications. The SPT has a rugged, compact design, with 316 SST wetted parts for excellent media compatibility. It is available in pressure ranges from vacuum to 10 psig to 0 to 5000 psi with a 1-6 VDC output and 8-15 VDC excitation. The accuracy is +/- 0.25% BFSL and burst pressure is 3 times full scale. Each unit is shipped fully compensated for pressure and temperature and is completely interchangeable without the need for further calibrations. It comes standard with a Packard connector, and meets IP-64. The Model SPT can be customized for OEM’s, such as special pressure ranges, tighter calibration, different electrical connections or pressure connections, etc. Please contact customer service at mctpmt.sales@ametek.com to discuss any special requirements or customization.